Pagan. . Wallpaper and background images in the Comparative Religion club tagged: religion paganism. This Comparative Religion photo contains 看板, ポスター, テキスト, 黒板, and サイン. The Greek, Norse, Kemetic, and many African deities required blood sacrifice as well. And the subjugation of women is hardly unique to Christianity. And the Greeks (and Norse), destroyed the world in a flood. And every creation myth has a corresponding destruction myth. The Norse destruction myth has the entire universe being destroyed by fire. By pagan Romans. Also God does not subject women! When Jesus came he shocked his Jewish community by treating women with respect and even having women disciples. Also things such as the flood are not proven because they happened before abraham and therefore I do not believe it to be true just as many Christians do not. Also the destruction of the world, God didn't create us to destroy us! He created the physical world to be the first step in creating His heavenly world. God will destroy the world because it will no longer be needed. But all of His followers will be saved. This picture does not depict the true meaning of Christianity and I just proved that. It's not really representative of anything :/ I think the idea here is to make Paganism look more loving and peaceful than it is, and Christianity (or maybe the Abrahamic religions as a whole?) a lot worse than they are. Which fails if one knows even a little bit about other Pagan religions and the Abrahamic religions. this isn't targeted towards abrahamic religion lol its targeted to those that worship more than one god/goddess. It's supposed to be a message from Pagans to the Abrahamic religions. ohh haha i see it now after reading it over again. "his own son" and destruction by flood" gave me clues that it was actually towards abrahamic religion. 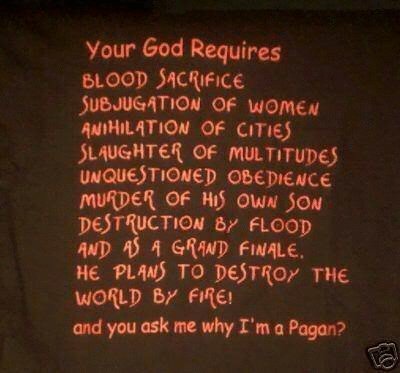 but blood sacrifices threw me off in the beginning because i dont remember that ever being required..